The Sea Knight is still the backbone of the USMC medium assault helicopter fleet. The CH-46D Sea Knight helicopter is used by the Navy for shipboard delivery of cargo and personnel. The CH-46E is used by the Marine Corps to provide all-weather, day-or-night assault transport of combat troops, supplies and equipment. Troop assault is the primary function and the movement of supplies and equipment is secondary. Additional tasks may be assigned, such as combat support, search and rescue, support for forward refueling and rearming points, aeromedic evacuation of casualties from the field and recovery of aircraft and personnel. 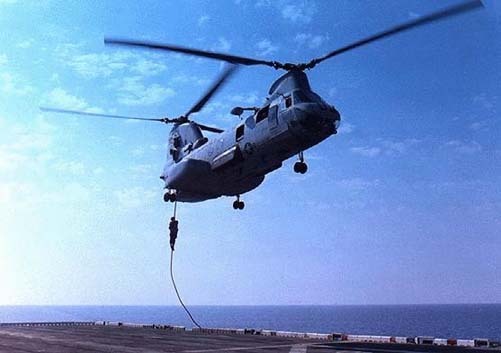 The CH-46 Sea Knight was first procured in 1964 to meet the medium-lift requirements of the Marine Corps in all combat and peacetime environments since that time. The Navy Sea Knight fleet is scheduled to be replaced by September 2004 with the MH-60S Knighthawk.